It would have been some time today that I’d call my mom up to share our fondest memories of Allan, and even some sad ones. I’d set aside some time and just talk. Call it part of our shared grieving process but even decades after his death, knowing how January 22 defined us meant a lot to me. But unless you knew me when it happened, I never spoke of him unlike my mom who talked like he was in the room next door waiting for us. A visit to his gravesite was always casually phrased as “I’m visiting Allan.” And as years went on, I tucked him further and further in the back of my mind despite my mom’s suggestion that’s there no shame in sharing it with people and not a pockmark on me as a person. In retrospect, I did it because of the explanation of how he died is a jumble of childhood memories and emotions. And talking about death in general — even in the past tense — makes people uncomfortable. Sadly, with my mom’s passing, there’s no one I can share memories about him. So I’m opening up and sharing the story of Allan. 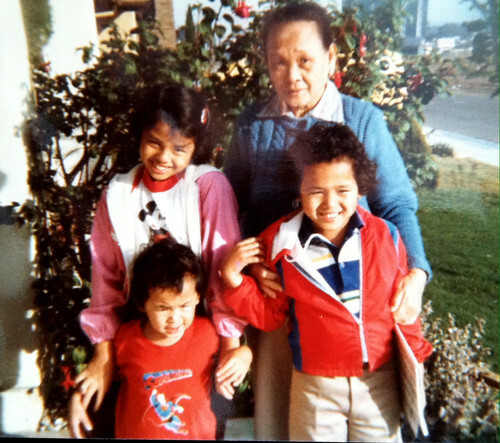 My maternal grandmother, Warren, Allan (wearing a Superman shirt) and me. Allan came to my family in the blustery cold day in November. Me, at the age of five, was unaware that my mom was pregnant until one morning, the sweet grandmotherly lady next door came over and prepped me and my other brother Warren, for a trip to the hospital to pick up the newest member of our family. My first sight of Allan was a shrunken little thing. I squished between the bucket seats of my dad’s Datsun as he drove home trying to get a better look at my new brother. Even days after, they wouldn’t really let me see him. Or maybe I was just too involved in the busy life of a kindergartener. My dad was my main caretaker tying my waist-length hair into a painful ponytail while my mom tended to the baby. For Allan’s first Christmas and a little more than a month old, he cradled was in his cradle looking like Santa Claus with white eyebrows. (My mom never explained what was going with that.) And I received the best present: a baby brother. We were due for a family trip the Navy Exchange where all military families went to do their bargain, tax-free shopping. Before leaving, my dad was delayed inside the house fixing a lamp while Warren, Allan and I played in the front yard. At the time, I was obsessed with ladybugs while Warren and Allan were doing boy things, namely playing catch with a softball. In between head dives into a bug-filled bush in our front yard, I reminded Warren and Allan to look ways before crossing the street but there was no really worry for traffic. At that time, a small farm was across the street in our sleeping neighborhood. After spending three years, one month, 22 days and handful of hours with Allan, we lost him. I had a ladybug in hand one moment and in the next Allan was lying on the road with a car stopped in front of him. He lay down broken with the softball next to him. There was a rush of things that followed soon after (I know because I had to recall it to a lawyer months later). I called out to my dad and he rushed out, immediately holding Allan on his lap in the middle of the street as a crowd of our neighbors formed. A passing car took them to the nearest hospital and Warren and I were shuttled off to our cousin’s house a block away as my mom followed in another car. Day turned into evening watching “The World According to Garp” and eating popcorn. (The last thing Warren, Allan and I ate was Jeno’s frozen thin-crust pizza.) When it was time to go home, my uncle walked Warren and me home without a word where we found our dad sitting on the piano stool crying. The days that followed were a rush of relatives and close family friends flooding the house throughout the week. And there were the unforgettable open casket visitations that have scarred me far deeper than anything to date. Lying in the baby blue casket wasn’t my baby brother. Instead a pasty, slightly bloated little boy looking similar to Allan was wearing a white suit — something I would never consider dressing him in. I couldn’t bring myself to touch him even as my mom kissed his forehead before the casket closed for the final time. Returning to school was surreal after a week off and things had changed. I was that student kids would point at, whose family was in the news making an already shy kid more unlikely to open up. Throughout my adult life, from elementary school to my adulthood, I never mentioned Allan again. I only had one brother to avoid explaining Allan. 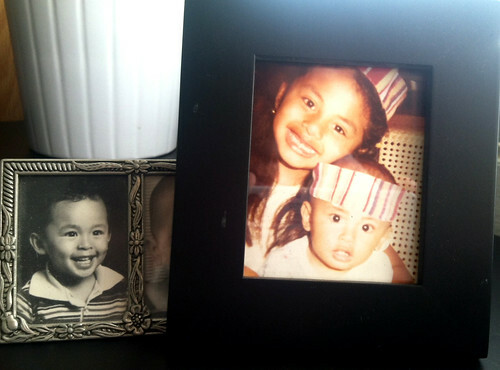 Realizing this my mom encouraged me to talk more and more about him, put out his photo. My favorite, is him as a baby and me posing with my pants cuffs sitting on our heads. You know how they say that time makes grieving a bit easier? It does but it never completely goes away. I wish he was still around even more this year to help me share memories about our mom.